"Before accessing this stream, please be very confident that you have the requisite skill (solid Class V), and be certain to treat the river, the land, the surroundings, and the local landowners with due respect. Relations with landowners in this area are fragile and could be severely damaged by a small amount of careless behavior." That is a pretty good summary, but let me share some beta which I hope will keep everyone safe and happy, and keep access open. First things first: This run is in a steep, "remote" gorge and has some very sketchy spots. Go with someone who knows the run your first time. Seriously. There are usually at least 2 or 3 carries for most folks, but there is always at least one mandatory portage in there - you simply MUST get out at the right spot above "Eye Of The Needle" (aka, "Inner Earth"). It would be very easy to miss this exit point and drop past the point-of-no-return here at Eye of the Needle. Most boaters, at most flows, carry "Gravity Cavity" and "Gorilla North" as well. Do yourself. and all of us. a favor: go with someone who knows the run on your first time down. It could save your life and it will definitely make your day much enjoyable. One more point: Do NOT block the school bus turnaround area at the take-out. Do not block the gate, do not block the logging spur on the left, and do not block the vehicle access to the creek-side field on the right. Because of these "rules," it is best if you leave the fewest cars possible at the take-out. Carpool into the area from other areas near I-81, and take as many cars as possible up to the put-in. After your run, take-out, retrieve shuttle and then celebrate at the top. One more thing: Be discreet about getting suited-up here at the take-out. There is a private residence within sight of the lot. The sheriff rolled through this area the last time I was there. This is a run for experienced Class V+ boaters only. No other creek in Virginia compares to Bottom Creek. The gradients are as follows: 1st mile=280 fpm, 2nd=300 fpm, 3rd=170 fpm, and the fourth mile levels out to 80 fpm. The section from above Gorilla to the bottom of Two Blind Mice is several times steeper than any of those numbers. The drops mentioned below are only some of the significant rapids on the run. The Waterfall Section drops at 800 fpm for about a quarter-mile. Go with someone who knows the run. There is one mandatory portage and almost always walking at Gravity Cavity and Gorilla North. And maybe several other popular carries, at normal flow levels. Missing the "Eye of The Needle" portage could easily be tragic. As one of the better paddlers I know said, "Bottom Creek makes the Upper Blackwater look easy." Access to this run is crucial and a serious injury, trespassing, or an evacuation from the gorge could threaten everybody's access to this Virginia gem. Sorry for all the warnings, but please let's don't screw this up. Put-in: Near Nature Conservancy preserve. Use a Gazeteer - or your local "guide" - to learn how to get there. There are several turns on tight county roads so please drive slowly. Take-out: Be extra courteous and respectful of the landowners in this area; drive slowly and be low-profile. Do not block the school bus turn-around area. I repeat: DO NOT PARK IN THE WAY OF THE SCHOOL BUS TURN-AROUND AREA. Park well off the road, and to the side, and not in the little niche the bus uses to turn around.Oh yeah, do not block the gate or any other access point. And be low-profile. Thank you. "The Kettles": a stout ledge series you'll encounter shortly after putting-on. Several routes exist depending on level. If you have trouble here you should probably head back to the ole' family truckster and save Bottom Creek for another day. Kettles is nothing compared to the rest of the run. The road is not far away. You can conceiveably bail out here. The Kettles are named for the potholes that dot the bedrock around this drop. "Gravity Cavity": Almost always a walk for most folks due to an ill-placed undercut/sieve. Don't miss the portage eddy on the right above the drop. Make the short portage around "gravity cavity" over the bedrock on the right. I've run this drop at super-high water but even then you could feel the sieve tugging at your stern. This drop is "NR" - Not Recommended. "Eye of the Needle": This is a Mandatory portage. 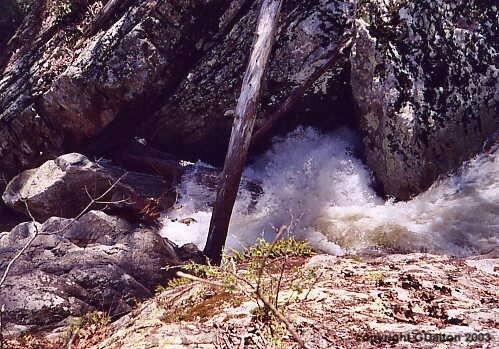 Here there is a narrow flume at the top leading into a huge sieve where the entire stream dissapears under mega-boulders. You MUST take-out well above the entrance flume and walk around the whole drop. It is essential that you know where this danger spot is - you could EASILY drop into it blind. A fun-looking class IV rapid leads into this unrunnable drop, so don't screw up. You may need to walk the rapid above Eye as well. (Some folks do a two-stage portage at river level. I recommend takeing-out early and going high up and around the left). Again: run this creek with someone who knows it. Carefully carry "Eye of the Needle" on the left, it is not an easy carry. I've even seen people get turned-around and get "lost," on the carry itself. Some kind soul has left a rope here to help lower boats. You can put-in immediately below the sieve by carefully sliding yourself off the sloped rock cliff into the pool below. "Eye of the Needle" is also called, "Inner Earth." Above: "Eye of The Needle" (aka, "Inner Earth"). Do not take this creek lightly! "Crash Test Dummy": This drop is right at the end of the short pool below the big sieve ("Eye of the Needle"). The whole creek funnels into a 3 to 4 foot wide waterfall dropping about 10-feet. The landing zone is shallow and the LZ feeds into an undercut on the right. At higher levels the landing zone becomes quite aerated, juicy and swirly. There's more fun and challenging stuff until you reach Gorilla North. "Gorilla North": is a stairstepping, hole-ridden flume. The second ledge creates a deceptively sticky hole/eddy that has caused some looooong sketchy hole rides. At lower levels it gets tight, at higher levels it gets thick. "Launch Pad", the rapid above Gorilla sits very close to the brink of Gorilla. Do not miss the eddy above Gorilla - especially at higher flow (!). "Launch Pad" is almost a lead-in to Gorilla North. Gorilla has been described as a, "drowning machine," by one of the original Roanoke crew that did what must have been some of the first runs on this outstanding river. "The Waterfall Section": This long series of rapids is the climax of the run. This is a long and steep class V+ drop. The "Mouse Trap" is the initial boof and slide, leading shortly into a couple ledges, culminating in the shallow, sievy "Swiss Cheese." Then the dramatic finale of the drop: "Two Blind Mice," is a rock garden leading into a 20' slide into a sticky low-angle hole. You might consider setting up a "traffic cop" on the right bank since you can't see the bottom of the drop from the set-up eddy. Beautiful and dramatic Camp Creek Falls is the 600' waterfall (2nd highest in Virginia) that plummets into the river from the left. Class IV+/V- boulder gardens: ...with wood. This is called the "California Section" due to the granite bedrock rapids. Nice tight slots and boofs with ever-shifting logs. Look out for wood in "Rock and Roll" especially. If this section were on almost any other creek it would be considered the "best" part. Here it is almost all unnamed, almost warm-down, section for the run. Still very fun and nowhere to relax too much. "Canoe": An 8-foot tall ledge has a sweet boof with a clapper of a landing possible. Understand this... The above description is merely intended to give you an idea of what's up. There are plenty of other drops in there, and probably several new hazards not mentioned. Go with someone who knows the deal! Please do not jeopardize your safety, or everyone's access to this creek. For more information or concerns drop me a line. ...and this: The pictures posted on this site are in no way intended to "promote" this run. This description, and the pictures herein, are being shared so that paddlers unfamiliar with this stream will understand that Bottom Creek Gorge is the real deal, and she should not be taken lightly. Here's a recent video that shows the vertical nature of this run. Enjoy. And be safe. I've never run this creek but hope to soon. I've hiked parts of it and it looks really, really difficult. A couple friends have boated it and they confirm this. There may be property issues. Please do not attempt this creek without a guide who knows it well. It is serious and there are serious land owner issues that could potentially shut the creek down to all kayakers. It would be horrible to lose access to a gem of a creek such as bottoms. Lets not mess up relations with the land owners, we do not want this river to go to waste like Johns has. Be Safe out there...and watch for wood below two blind mice, it tends to collect on the bottoms section. Some fellow Virginia Tech paddlers and I ran Bottoms yesterday and since it hasn't run in over a year (meaning above 0 inches), some things have changed. The gauge is pretty broken because the river widened there (the first run, it said 1 inch and was more like 4 and the second run said 5 inches and was more like 11). There is a great deal more wood in this creek now too. It is primarily in the runout but it is also spread throughout the run. Please be careful and take your time with this run. The only specific wood that I can remember is a riverwide log at the bottom of the rapid below Canoe. Don't die or get stuffed under some wood on this creek. hihi Thanks, Ellenberg Go big P.S. I swam on both runs. should not have been there that high!! The gauge on the bridge near the take-out has changed since the '90's. There is a yellow-painted scale on the river-left piling. There is also a single white tick mark on the right piling. The tick mark roughly equals the "old" 6 inches and is roughly commensurate with the yellow-scale 2 inches. I will not address max/min levels here - that's your personal call. Mostly I judge the level of water above the pilings footer ledge. If there is about 1" of water over the left piling footer then you can make it down without too much scraping. If "Kettles" rapid is too pushy then you may want to head back to the car before you get over your head down in the gorge. Hiking out from the Gorge could be very unpleasant and you must not trespass in there. NEW GAUGE: There is a new gauge on the upstream, river-right piling of the bridge at the put-in. The bottom mark is a decent minimum. If the level is at the top of the top mark, or lapping onto the flat top of the piling footer, then you have a solid "medium" flow (although some folks say this level is "too high"). As it gets above the red marks, or above the piling footer, it is getting into "stout" territory. Having your local-type "guide" friend show you the access. Buy him beer. Be respectful of the area and the residents.